I’ve been writing professionally for over thirty years at this point, having sold fresh out of college. While that is in some ways very daunting to me, what is even more daunting is something most writers face, especially if they get beyond story number one. I’m not saying that each novel has to be 100% original. No one can do that, not even those having been hyped as having done so. Dig even a little and you find some very familiar things. Any originality generally comes in the execution. In other words, how you present the elements of your story. To be frank, there is nothing wrong with using familiar elements from one story to the next. Despite what some say, the majority of readers enjoy familiarity. When writers do something so utterly different from their past work, especially in a series, there are often repercussions. This is not to say that you avoid growth. Again, it is all in the execution. To the point of this. One of the things I am best known for in terms of my writing — other than Dragonlance — is the series that actually started it all for me. Without my Dragonrealm saga, I would have never become part of Dragonlance, for instance. The first novel, FIREDRAKE, was the primary writing sample I showed to the editor of the Dragonlance line. Evidently impressed by that, they asked me to contribute to their anthologies and then, a short time later, to write what would become the LEGEND OF HUMA, a New York Times Bestseller for the series and a novel I still get compliments on these days. On the strength of that work, I also continued on with my world after FIREDRAKE. 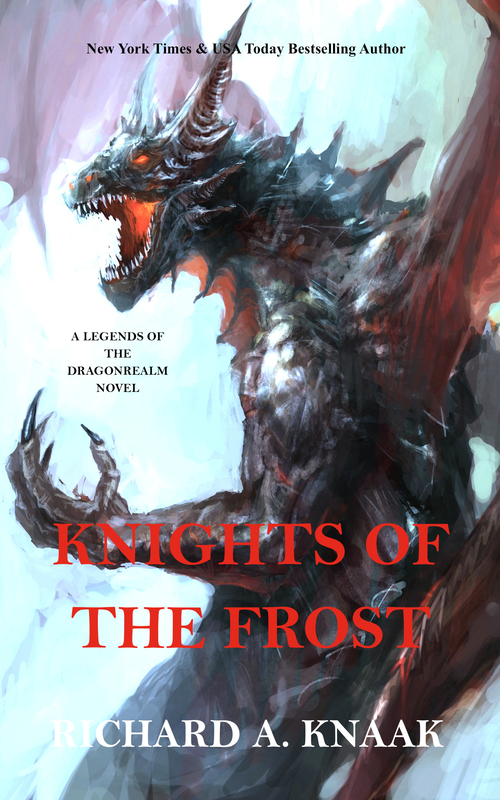 At this point now, I am releasing KNIGHTS OF THE FROST, the fifteenth novel in the Dragonrealm. I’ve also written several novellas in that world, too. There are not a lot of series that go that many stories. Those that do are often multi-author sets controlled by a publisher. Others are one huge story, with each book essentially a chapter as opposed to a single novel. Then, there are those like my Dragonrealm. I’m certainly not the only one who works this way, which is good since I’m a reader as well as a writer. I enjoy diving into other people’s worlds. However, in terms of the Dragonrealm, this is what I do to try to keep things intriguing even after all these years. When I created the Dragonrealm, I always envisioned it as a multiple novel setting. That is hardly new. What I did not do at first, although I have done since then, is write the proverbial trilogy, FIREDRAKE was written as a standalone novel, with the intention of expanding events and their repercussions in the other three initially planned. However, even those sequels were all devised with the notion that they might be the last, meaning each had a definitive ending, while also leaving some threads open that could be explored later. Therein lay the most essential point to the Dragonrealm. As each novel came to fruition, I tried to consider what not only the overall outcome meant, but how that outcome would affect individual characters or other situations. I began to develop the various stories — the progressive lives — of several characters, even some who were not primary ones. After all, they were interacting with the principals, would they not go through some changes, too? I have characters who live centuries — some longer — and others who do not. I moved time ahead and brought in some new characters who were children of the first ones, which did not mean I shunted the original ones aside. Their lives changed as their families grew and, in some cases, were threatened. As is sometimes the case, some characters did die. However, I always tried to make the deaths relevant to the situation so that it made sense. In KNIGHTS OF THE FROST, for instance, there will be a few shocks, including death. That last was not done because I wanted to shake up my readers. It was done because, as the storyline progressed through the books, it finally brought matters to that point. I am aware of the future paths — assuming they have one! — of most of my characters far beyond my current novel. If the events of the Dragonrealm world reach particular points in future novels, I will include what must be included. I believe anyone who has read through the series will see the natural progression and, hopefully, appreciate it. Sometimes, characters and stories will even surprise me by leading to developments I had not originally envisioned. I always welcome those; they show me that I have clearly done something right. A world developed well SHOULD offer its own areas of expansion, even if the writer chooses not to delve into those areas. For example, even events that occurred n FIREDRAKE can still have repercussions extending into KNIGHTS OF THE FROST. Some of those events were not originally intended to do so, but became natural outgrowths of incidents and finales in novels and stories in between. I also added novellas to fill in some situations that were significant, but did not warrant a fool novel. However, some of these, in turn, fueled developments that became full-length novels later on. Mixing in novellas has proven to be an excellent method for keeping the series fresh. At one point, I wrote the initial six novellas in a row, even intertwining some of their stories into what might be considered a smaller novel. I have added more novellas since then, often focusing on different characters from the series and offering revelations about the backgrounds of each. Speaking of characters, one benefit from the start was deciding that not only would I have a number of principal characters, but that they would clearly continue to both share the limelight and have their prominent moments. The same character is not always the chief player in each book, although we often see several of them. Particular novels have especially focused on one or two, such as SHADE did. Nothing I am saying is earth-shattering. Still, I constantly come across writers both new and well-published who have not only not made use of these methods, but did not, until then, realize the benefit they offered in extending their ideas and worlds in a fresh manner. That’s why I have insisted on speaking about them on and off over the years. It’s also in part because I am still a reader and certainly would not mind seeing some of the stories I read expanded. However, not every story allows what I’ve talked about. Some are destined to be — and should be — single tales well worth rereading over and over. For the rest, though, other writers following through as I have means one thing. Richard A. Knaak is the New York Times and USA Today bestselling author of The Legend of Huma, WoW: Wolfheart, and nearly fifty other novels and numerous short stories, including works in such series as Warcraft, Diablo, Dragonlance, Age of Conan, the Iron Kingdoms, and his own popular Dragonrealm. Black City Saint, and Rex Draconis sagas. He has scripted comics and manga, such as the top-selling Sunwell trilogy, and has also written background material for games. His works have been published worldwide in many languages. His most recent releases include Black City Demon — the second in his new urban fantasy series from Pyr Books, Lords of the Dragon Moon for his epic Rex Draconis saga, and Climate Changeling, based on the Flash television series. He is presently at work on several other projects, among them continuing Knights of the Frost for the Dragonrealm, Shadows of the Dragon Moon — the next step in the Rex Draconis saga— and more. Black City Dragon, the third in the Black City Saint series, will be released December, 2018. Currently splitting his time between Chicago and Arkansas, he can be reached through his website: http://www.richardallenknaak.com where more information on this trilogy can be found. While he is unable to respond to every e-mail, he does read them. Join his mailing list for e-announcements of upcoming releases and appearances. Please also join him on Facebook at @richardallenknaak and Twitter.